By SID student Terhi P.
Howzit? My calendar tells me that I have been here in Cape Town for three months now. Time flies, even in a place where the concept of time is very different, African-time, as they say. I am here related to the UFISA collaboration and been mostly involved with the activities of Kujali Living Lab, social incubator for ICT based solutions at the Cape Peninsula University of Technology (CPUT). Kujali has provided me an opportunity to take part e.g in a rural community development initiative, as well as to work together with local emergency unit doctors in a mobile app development project. It has been an interesting opportunity to introduce and apply service design methods and tools in a foreign culture and context, and there is a great interest to strengthen design thinking approach for development initiatives. Kujali has also a new “accelerator” office at Bandwith barn, a hub for innovative, design focused companies and start-ups, through which I have been able to gain insights on the creative industry side of the city. In addition to Kujali projects, I have been taking part in a course on Design Theory & History, together with local Industrial Design students. It’s been really interesting to see how design subjects are taught in a university another side of the world. Not that differently actually. Lekker. I am also very much looking forward to a new collaboration project that is starting in connection to the CPUT Desis Lab, where our aim is to utilize service design approach and methods in a renovation process of a medical clinic. I have also attended couple special design workshops while in here. 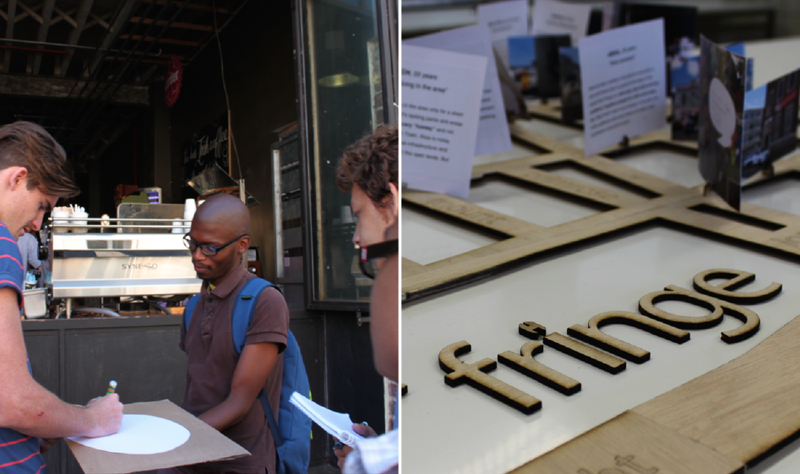 CPUT design department is collaboration closely with Köln International School of Design (KISD), and one of the concrete manifestations of the collaboration is a joint project investigating the urban phenomena of gentrification in Berlin and Cape Town. At the end of February students from KISD came to hold a week long workshop to study and discuss the topic and the potential role of design in urban development together with CPUT students. We started with an introduction on findings from Neukölln, Berlin and were then divided into groups to investigate and produce presentations on the phenomena from Cape Town perspective. My group decided to focus on Fringe, an area with rather shady reputation but under government lead renewal programme. Our aim was to map the “voices” and thoughts of the people living and working in the Fringe, about the past, present and future. We interviewed people representing different “walks of life” and created a three dimensional map of the area with citizen profiles, as well as an audio recording of the expressed viewpoints. As I had just arrived to the city, the workshop provided me both an opportunity to familiarize with the topic and students, as well as a real intensive course to Cape Town, couple of the neighbourhoods and the kind of issues and changes they deal with. The group presentations were a good example of how such a complex phenomena as gentrification can be both approached and experienced in various ways. The project will continue in new locations and plans to return to Cape Town during the World Design Capital year 2014. 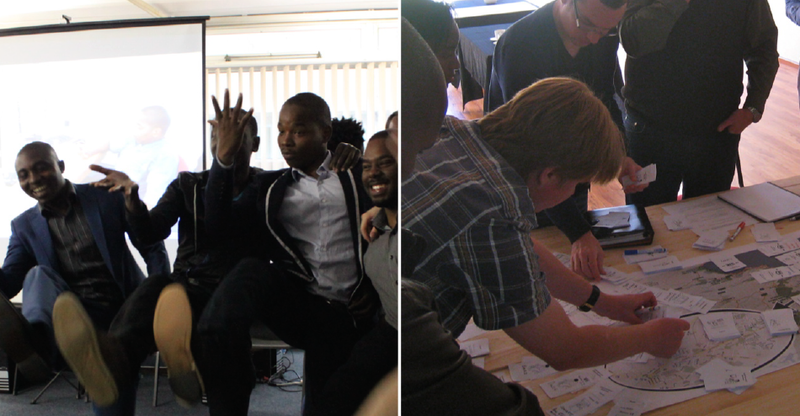 On the last Friday of April I also took part in an Open Design Hackathon organized by RLabs in Bridgetown. RLabs is a great local, community empowerment, training and incubator initiative and social enterprise movement that has spread also internationally. The design Hackathon gathered together around 20 people, both from Rlabs as well as Capetonians with interest on social design and development. During the day we brainstormed ideas to different challenges, discussed and refined them further, and developed our ideas into preliminary concept descriptions for joint discussion. My group focused on the challenge of enhancing public participation and the communication between citizens and public authorities, and ended up proposing solutions in a more systematic and structural level. I met some very interesting people, learned a lot about Cape Town and South Africa and heard interesting ideas form other groups related to e.g. improving health related education in townships and safety in public transportation. There would be a lot more (and perhaps even more interesting) stories to tell related to immersion to local habits, learning about Ubuntu and about the vast variety of local cultures, layers and different ways of living and working; all the good, the bad and the ridiculously beautiful in a one of the most diverse places in the world. Not to mention the things that you are bound to learn about yourself while living in very different environment. But those stories would not fit into one blog post. They are the ones that I keep collecting the time that I have in here. I still have some learning to do also regarding proper handshakes and ”clicking”, in order to pronounce properly the names of some of the great guys working at the Kujali Lab. Ja.